Conveniently located near Dupage, Cook, Will, Lake and Kane County in Oakbrook Terrace, Illinois, our Law Offices of Mary Davis, P.C. have been serving throughout the state of Illinois for more than 21 years. We have experience representing families and individuals throughout a wide range of family law cases including divorce, paternity, child custody, child support, visitation, spousal support, and all other related legal matters. Attorney Mary Davis and her staff are knowledgeable legal professionals that are able to mediate, litigate or conduct other necessary legal avenues in order to efficiently represent clients. At the Law Offices of Mary Davis, P.C. our clients are treated as individuals and each case is handled with personal attention. We promptly return our clients' phone calls and keep them informed about exactly where their case stands at every stage of the legal process. Going through a divorce is often an emotional and complicated process requiring experienced legal counsel in order to obtain the best possible results. Important financial decisions involving support payments or division of assets can easily become difficult tasks while dealing with the emotional reality of a divorce. With our knowledge and experience as family law professionals, we can help alleviate the pressure by focusing on obtaining our clients goals. 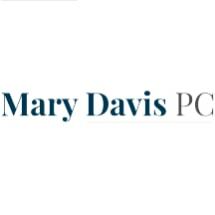 Regardless of the legal case and what challenges that lie ahead, at the Law Offices of Mary Davis, P.C. we are there for our clients, from start to finish.